Here is a thought to the wooden handeled Schutztruppen Bayonet in Post 10. 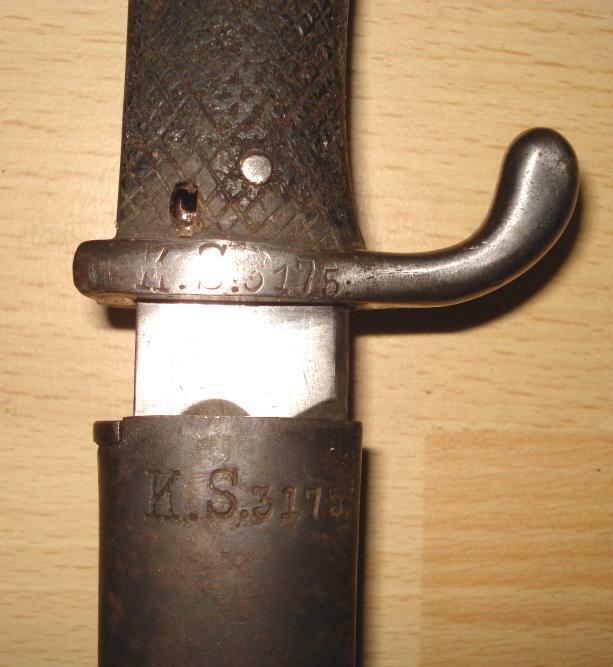 These are not K.S.XXXX stamped and were made in 1913. 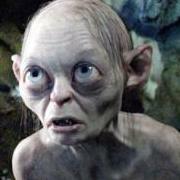 New thought... why do we assume GSWA? Why not GEA? There were just as many South African troops there... most served in both theaters. GSWA must have been well stocked by 1913, is there any reason to think they would need a last rsupply in Bayonets just before the outbreal of the war? 3 800 "modern" Rifles... and presumably the bayonets to go with them? Just bearing in mind the really small number of German troops( no natives enlisted) in German South West and East Africa's larger troops with large native contingent though mostly equipped with 88 model rifles in need of update to more modern weapons. I have not seen any 1913 dated bayonets with colonial armory numbered markings on the crossguards. The theory is very probable that the blockade breakers delivered 1913 manufactured KS98 bayonets in GEA ,which were never stamped or numbered by the colonial armorer or quartermaster because of the pressure of war . As you know the GEA bayonets were marked "SCH.D.O.A.. 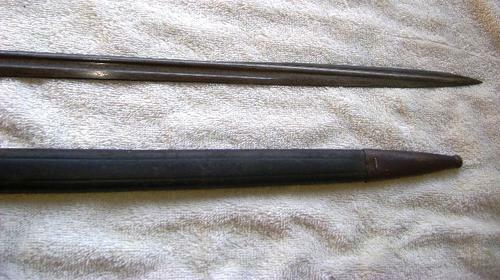 The KS98 bayonets are seen with leather chequered riveted handles and screwed bakelite or wood handles (I presume the two latter type have been re-handled. I have also read ,and I must find the reference, that a shipment of rifles and bayonets were sent from German South West Africa to GEA after 1913 as GEA was unable to get supplies from Germany .Therefore KS stamped rifles and bayonets could also have come from GEA . It may be that some of the Hoerster 1913 unmarked bayonets went to DOA but the Imperial War Museum had one on display with an old handwritten tag saying that it was captured in DSWA. The only pity is that they are indistinguishable from those used on the European theatre of war ,during WW1 ,and as such can have no rarity value! 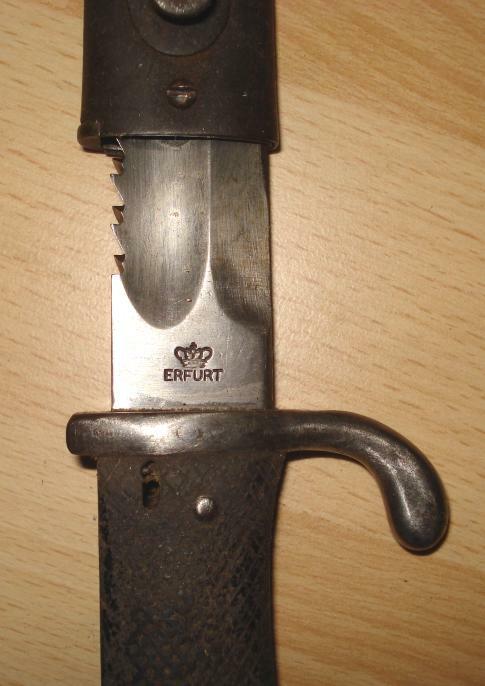 The identifying factor is that they are all E&F Hörster 1913 wooden gripped kS98 bayonets. I think this batch were all for colonial issue. Has anyone seen one for home army use? Chris thanks for the info.We have wandered a bit of the subject as the thread was DSWA bayonets and we are now dealing with GEA or DOA bayonets .Maybe we should open another thread .? 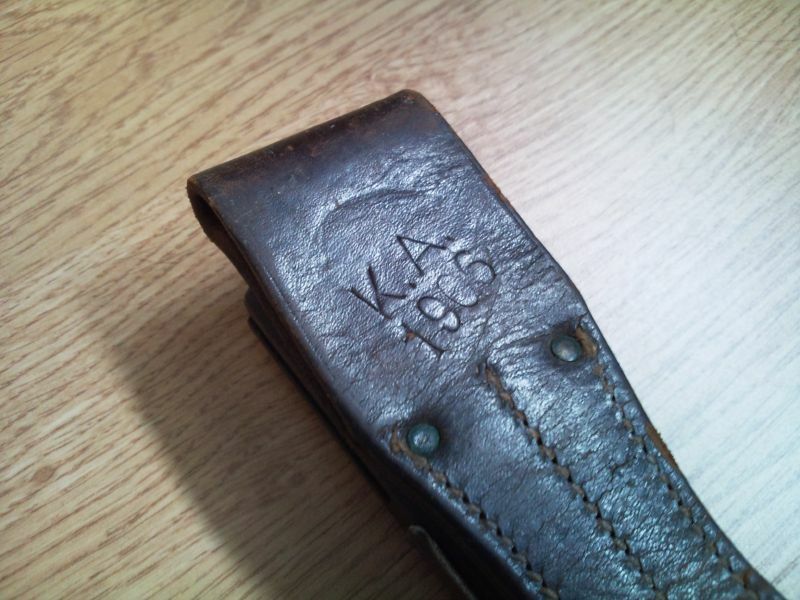 I think these pictures are pre 1906 as the bayonet worn after 1905 was the KS98.Nice photos. Where is the third photo? The few pics I have seen with KS98 all seem to be just before WW1.... unless we have any earlier ones with KS98? ChrIs I will look at more of my photos and see if I can establish more facts. 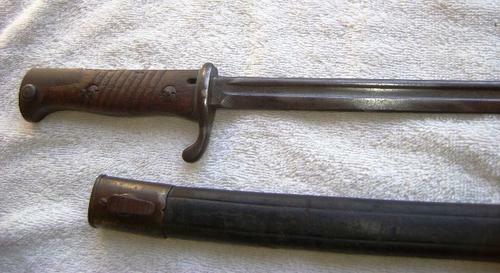 Chris the earliest KS 98 bayonets I have on my list are from 1904 and the last are 1912. It is true that the largest numbers appearing have 1912 abnahme stamps. 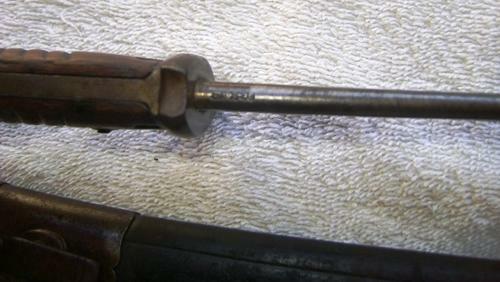 New on the site, I'm from France and I collect sawback german bayonets. I've read with a great interest this very interesting thread. Are you sure that the F.R. marking is for "Field Regiment" in GSWA, during the herrero rebellion? I didn't know that GSWA got the 98/02 bayonet. 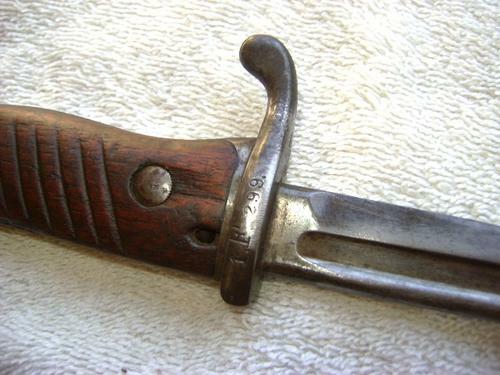 Please also post detail photos of the Feld Regiment bayonet . 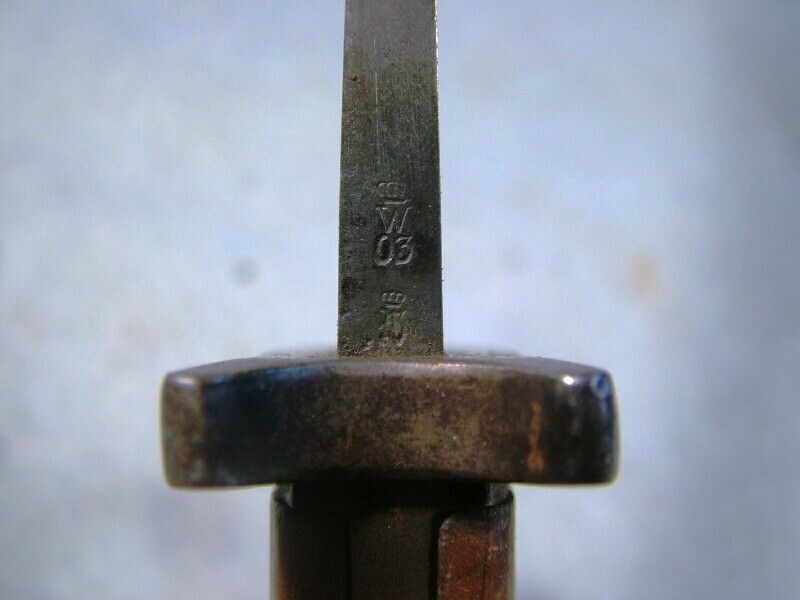 On the bayonet guard, the "7" is 4 mm high and the other numbers are 3 mm high. On the scabbard, they are all 3 mm high. I'll try to take a good picture of the 98/02. Thanks for rekindling this thread Fross, nice addition! Here's a bad picture of the 98/02 guard. 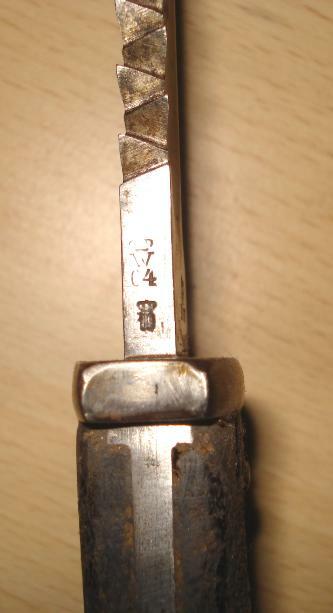 It's hard to read the marking because this bayonet was in a very bad shape and it has been restored and polished. The grips have been replaced by modern reproductions. With the help of a magnifier, I can read "2.F.R. blank .12"
What is the date on the spine? I believe 2. FR .12 would stand for Second Feld Regiment weapon number 12 . Scabbard is leather with metal fittings with non matching number "4195" ..Only this number no "F". 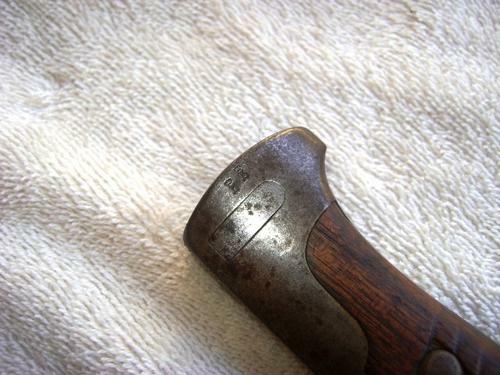 Chris posted a nice photo earlier in this thread of the S98 in wear by a Schutztruppe member. No pic, but it's W06. Tthe Schutztruppe were only temporarily formed into regimental units during the Herero Rebellion. No. The two field regiments were not part of the DSWA schutztruppe. The facts were that the Herero uprising caught the country by surprise and there were not enough troops in the country to control the uprising which had escalated into a war.Up to this stage the small Schutztruppe was made up of 4 Feldkompanies and small detachments in major towns .An expeditionary force and a Seebattalion were hurriedly sent from Germany early in 1904 followed by more troops ,and the Feldregiments were formed in German South West Afrika after midyear.They were certainly Schutztruppen and clothed and armed accordingly.Troop transports kept arriving for the balance of 1904 and well into 1905 ,so that the Schutztruppe strength was about 14,500 in May 1905. 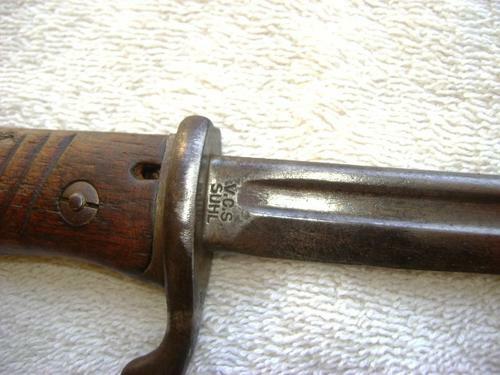 This would explain why the 1904 marked KS bayonets are rather seen less often and those marked 1906 upwards are more readily seen. Does anyone have any definitive evidence as to when kS98 started to be issued to DSWA troops. I have heard it mentioned that it was around 1910 but without any proof. I am hoping that it might be possible to put a date on this from photographic evidence? The year stamp on the back of the kS98 blade is of no value whatsoever in this instance.